Description: Aqua "magical" spoon with a bite of food on the spoon. When children dip the spoon into the food servings in the FPT13229 warmish dish, the color of the food on the spoon changes. Description: Aqua spoon with a raised flower print on the end of the handle. The handle is narrow at the top, and gets wider on the end of the handle. The end of the handle is squared. Measures 3-1/2" long, 1-1/4" wide. Marked "F-P TOYS" on the back. 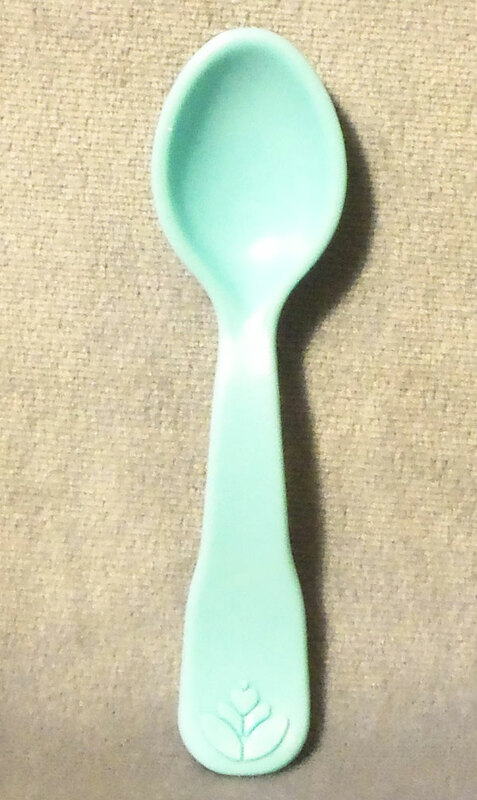 Description: Aqua-green spoon with an imprint of a heart with 4 "leaves" below it on the end of the handle. The end of the handle is rounded. Back of the handle is marked, "FISHER-PRICE" and "MADE IN KOREA". Measures 4-1/4" long. 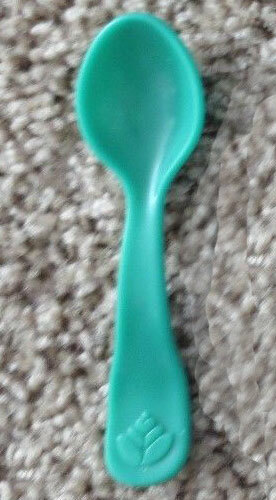 Description: Aqua-green spoon with an imprint of a heart with 4 "leaves" below it on the end of the handle. The end of the handle is rounded. Back of the handle is marked, "©'86 F-P" and "MADE IN CHINA". Measures 3-1/2" long. 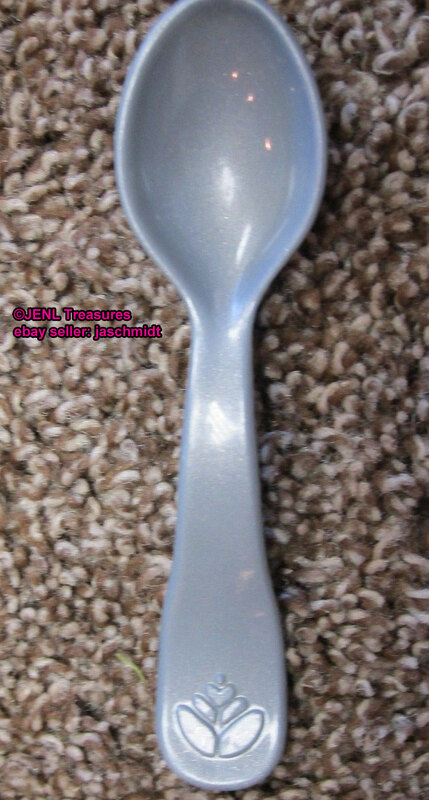 Description: Large blue mixing spoon with an oval-shaped handle and a round spoon head (straight vs. curved, like most spoons). The handle has a raised "Fisher-Price" imprint in the middle and an oval-shaped hole on the end of the handle. Back of the handle is marked, "©1987 FISHER-PRICE". Measures 5-3/4" long x 1-1/2" wide spoon bowl. Description: Blue spoon with an imprint of a heart with 4 "leaves" below it on the end of the handle. The end of the handle is rounded. Back of the handle is marked, "FISHER-PRICE" and "MADE IN KOREA". Measures 4-1/4" long. Description: Light blue spoon with an imprint of a heart with 4 "leaves" below it on the end of the handle. The end of the handle is rounded. Back of the handle is marked, "FISHER-PRICE" and "MADE IN CHINA". Measures 4-1/4" long. Description: Large light blue mixing spoon with an oval-shaped handle and a round spoon head (straight vs. curved, like most spoons). The handle has a raised "Fisher-Price" imprint in the middle and an oval-shaped hole on the end of the handle. Back of the handle is marked, "©1987 FISHER-PRICE". Measures 5-3/4" long x 1-1/2" wide spoon bowl. Description: Green spoon with a smiley face. Description: Green (dark green) spoon with an imprint of a heart with 4 "leaves" below it on the end of the handle. The end of the handle is rounded. Description: Orange combination spoon and spatula. The spatula head is shaped like a cake frosting spreading utencil. The center of the head has a spoon indention. The handle has a raised oval-shaped edge with a raised "Fisher-Price" imprint and a raised dot on the end with a smiley face imprint. Description: Orange combination spoon and spatula. The spatula head is shaped like a cake frosting spreading utencil. The center of the head has a spoon indention. The handle has a raised oval-shaped edge with a raised "Fisher-Price" imprint and a flower imprint on the end. Description: 3 measuring spoons that are attached at the top of the handles. 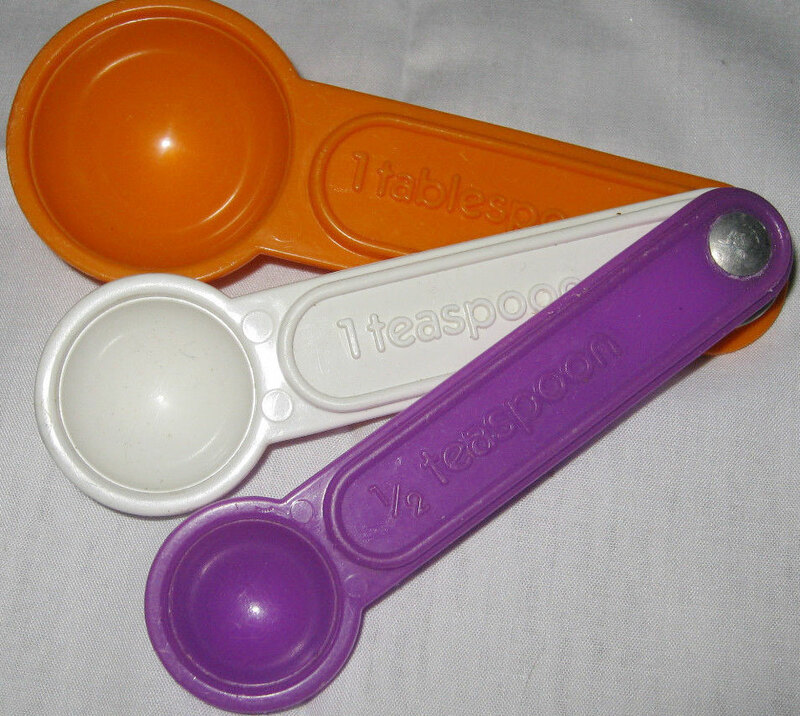 The biggest spoon is orange (marked "tablespoon"), the medium spoon is white (marked "1-teaspoon"), and the smallest spoon is purple (marked "1/2 teaspoon"). Description: Light pink spoon with a long-stem flower print on the end of the handle. The handle is narrow at the top, and gets wider on the end of the handle. The end of the handle is squared. 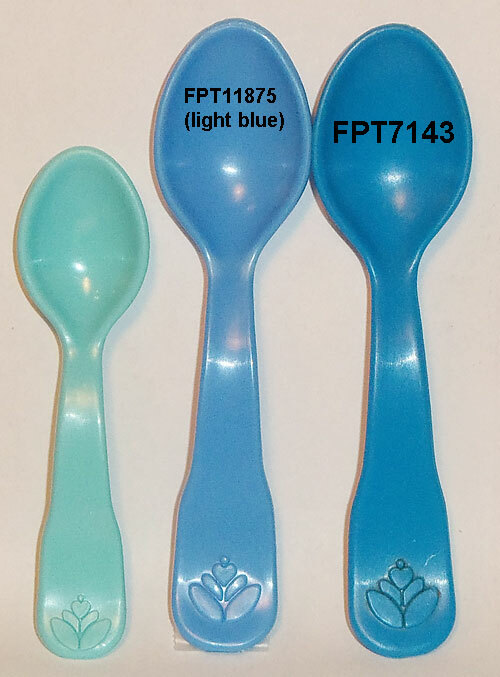 The back of the spoon is marked "F-P TOYS". Measures 3-1/2" long. 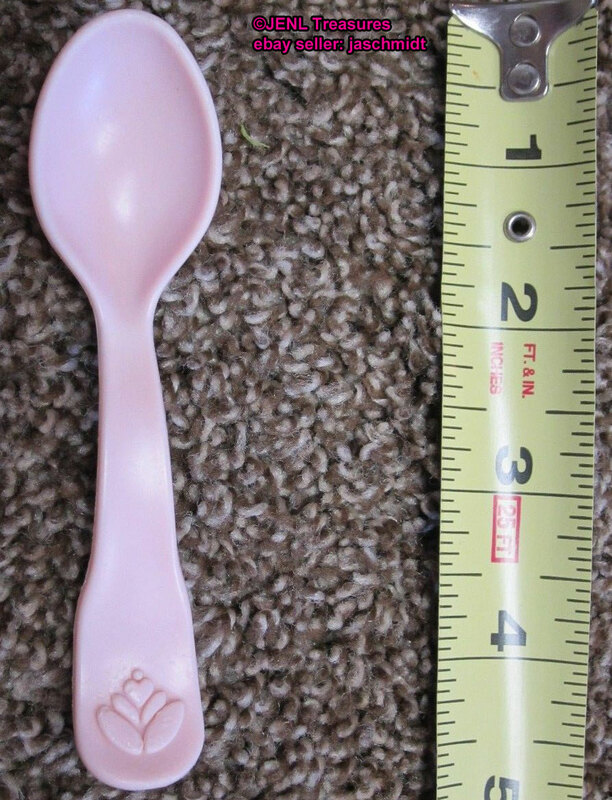 Description: Pink spoon with an imprint of a heart with 4 "leaves" below it on the end of the handle. The end of the handle is rounded. Description: Large pink ice cream scooper spoon with an oval-shaped handle and a round spoon head. The handle has a raised "Fisher-Price" imprint in the middle and an oval-shaped hole on the end of the handle. Back of the handle is marked, "©1987 FISHER-PRICE". Measures 5-3/4" long x 2" wide spoon bowl. Description: Lavender (light purple) spoon with an imprint of a heart with 4 "leaves" below it on the end of the handle. The end of the handle is rounded. Description: Purple spoon with an imprint of a heart with 4 "leaves" below it on the end of the handle. The end of the handle is rounded. 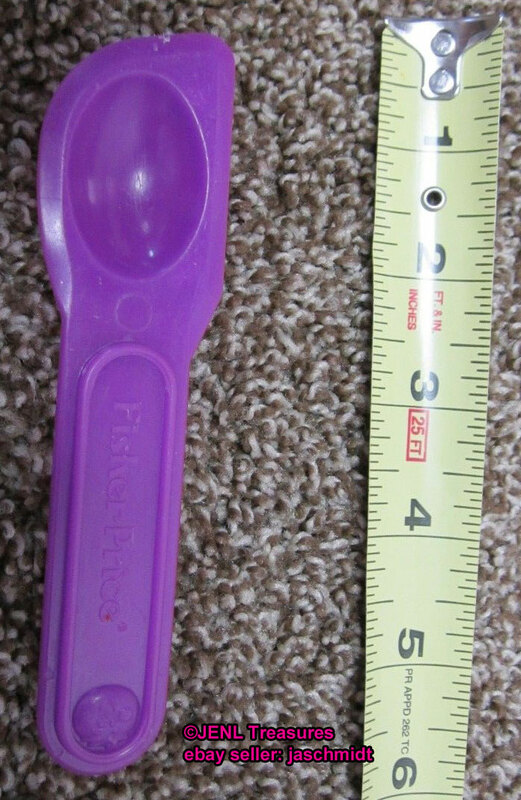 Description: Purple spoon with a long handle. The handle is very narrow near the spoon head, but it gets wider near the end of the handle. The end of the handle has a wide squared section, then another wide squared section with a flower imprint, then a recessed rounded section on the tip end of the handle. Description: Purple combination spoon and spatula. The spatula head is shaped like a cake frosting spreading utencil. The center of the head has a spoon indention. The handle has a raised oval-shaped edge with a raised "Fisher-Price" imprint and a raised dot on the end with a smiley face imprint. Description: 3 measuring spoons that are attached at the top of the handles. 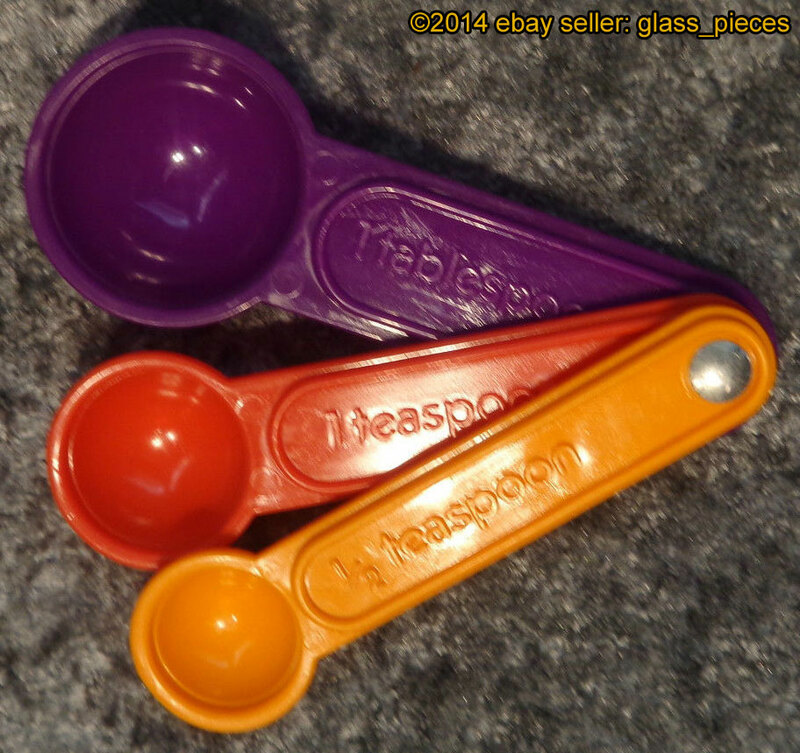 The biggest spoon is purple (marked "tablespoon"), the medium spoon is red (marked "1-teaspoon"), and the smallest spoon is orange (marked "1/2 teaspoon"). Description: Red rattling spoon with a clear plastic cover on one side and multi-colored beads inside that rattle. The back of the spoon has a molded cherry with a smiling face and is marked "©98 F-P, INC., CHINA". Measures 4-1/4" long, 2" wide, 1" deep. Description: Red combination spoon and spatula. The spatula head is shaped like a cake frosting spreading utencil. The center of the head has a spoon indention. The handle has a raised oval-shaped edge with a raised "Fisher-Price" imprint and a raised dot on the end with a smiley face imprint. Description: Small red spoon with a picture of an orange and brown bear's face on the end of the handle. The bear face is in the center of a yellow circle. Description: Red spoon with a raised half-circle notch near the top. The notch fits into a hole on the FPT44925 spork, attaching the spoon and spork together. When together, they fit into the side of the FPT7356 knife. Top of the handle has "f" and "p" within circles imprint design. Bottom of the handle is rounded. Description: 3 measuring spoons that are attached at the top of the handles. 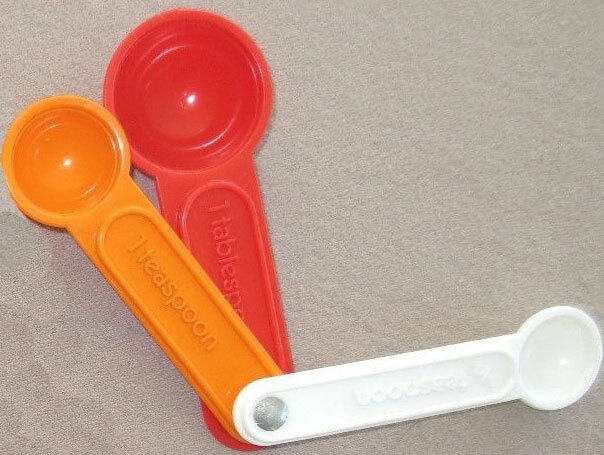 The biggest spoon is red (marked "tablespoon"), the medium spoon is orange (marked "1-teaspoon"), and the smallest spoon is white (marked "1/2 teaspoon"). Description: Silver spoon with an imprint of a heart shape and 4 "leaves" below it on the end of the handle. The end of the handle is round. Description: White coffee spoon with a short rounded handle. 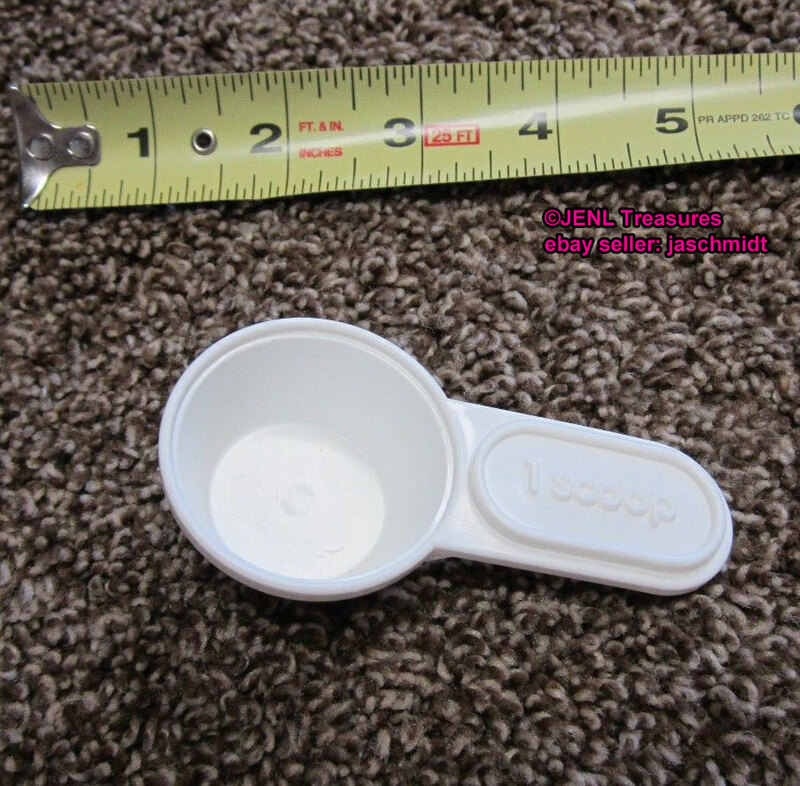 The handle has a raised oval imprint marked "1 scoop" in the center. Description: Small white plastic spoon with a picture of a red and black bear's face on the end of the handle. 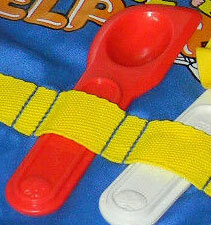 Back of the spoon is marked, "F-P TOYS". Measures 4-1/8" long. Description: White spoon with a raised heart print on the end of the handle. The handle is narrow at the top, and gets wider on the end of the handle. The end of the handle is rounded. Back of the handle is marked, "©'97 F-P" and "MEXICO". Measures 3-1/2" long. Description: White spoon with a raised flower print on the end of the handle. The handle is narrow at the top, and gets wider on the end of the handle. The end of the handle is squared. Measures 3-1/2" long, 1-1/4" wide. Marked "F-P TOYS" on the back. Description: White spoon with an imprint of a heart shape and 4 "leaves" below it on the end of the handle. The end of the handle is round. Measures 4-1/4" long. Description: Large white mixing spoon with an oval-shaped handle and a round spoon head (straight vs. curved, like most spoons). The handle has a raised "Fisher-Price" imprint in the middle and an oval-shaped hole on the end of the handle. Back of the handle is marked, "©1987 FISHER-PRICE". Measures 5-3/4" long x 1-1/2" wide spoon bowl. Description: White combination spoon and spatula. The spatula head is shaped like a cake frosting spreading utencil. The center of the head has a spoon indention. The handle has a raised oval-shaped edge with a raised "Fisher-Price" imprint and a raised dot on the end with a smiley face imprint. Description: 3 measuring spoons that are attached at the top of the handles. 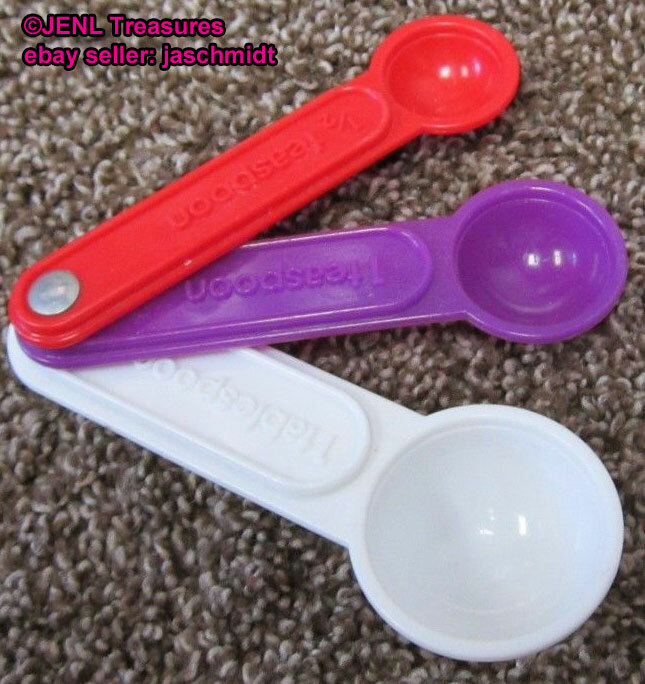 The biggest spoon is white (marked "tablespoon"), the medium spoon is purple (marked "1-teaspoon"), and the smallest spoon is red (marked "1/2 teaspoon"). 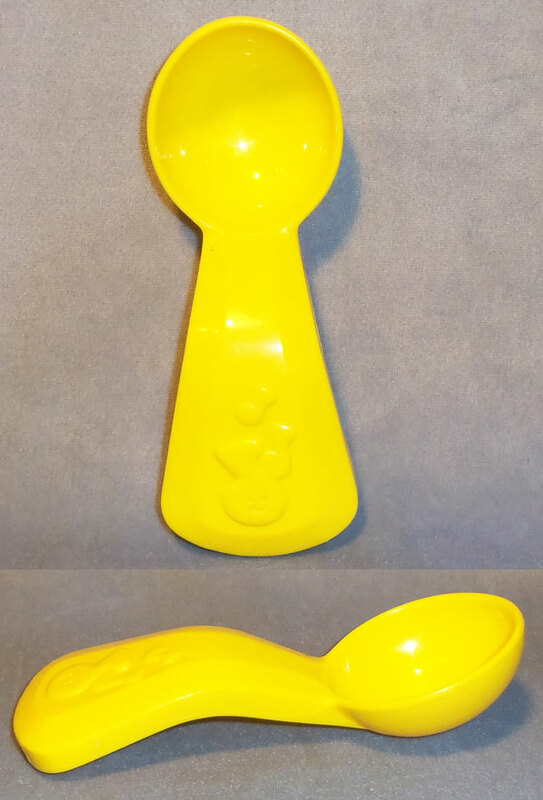 Description: Yellow spoon with a handle that is wider at the end than the top. The end of the handle is squared. Back of handle is marked, "F-P Toys". Measures 4-1/4" long x 1-1/2" wide. Description: Yellow teaspoon that has a flower molded into the plastic on the end of the handle. The end of the handle is squared. Back of the handle is marked, "F-P TOYS". 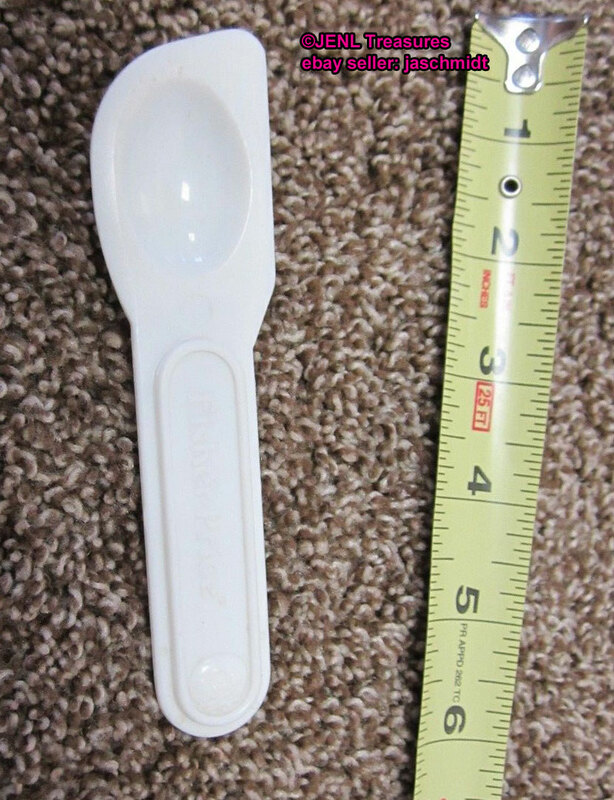 Measures about 3-1/2" long x 1-5/16" wide spoon head. Description: Yellow plastic spoon with a tiny heart and "leaves" under the heart molded on the end of the handle. The end of the handle is round. Marked "FISHER-PRICE, MADE IN CHINA" on the back of the handle. Measures 4-1/4" long x 1-1/16" wide. Description: Big yellow spoon with a round loop on the end of the handle, and an imprint of a smiley face in the center of the spoon. 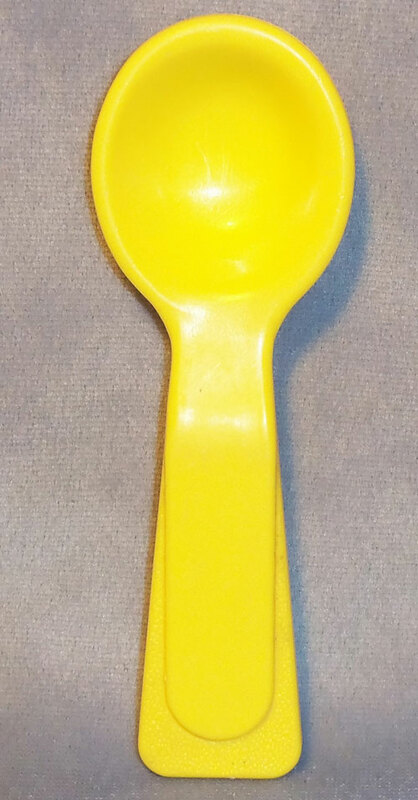 Description: Yellow spoon that doubles as a whistle. End of handle has 3 molded musical notes (largest has a smiley face). Back of handle is marked, "©1988 FISHER-PRICE". Measures 5-3/4" long x 2-1/8" wide x 1-3/8" high. Description: Yellow spoon with a large round hole in the end of the handle, and an apple imprint below the hole. The neck of the spoon has 2 rings near the spoon head. Description: Yellow pasta scoop spoon with 9 spokes around the spoon. 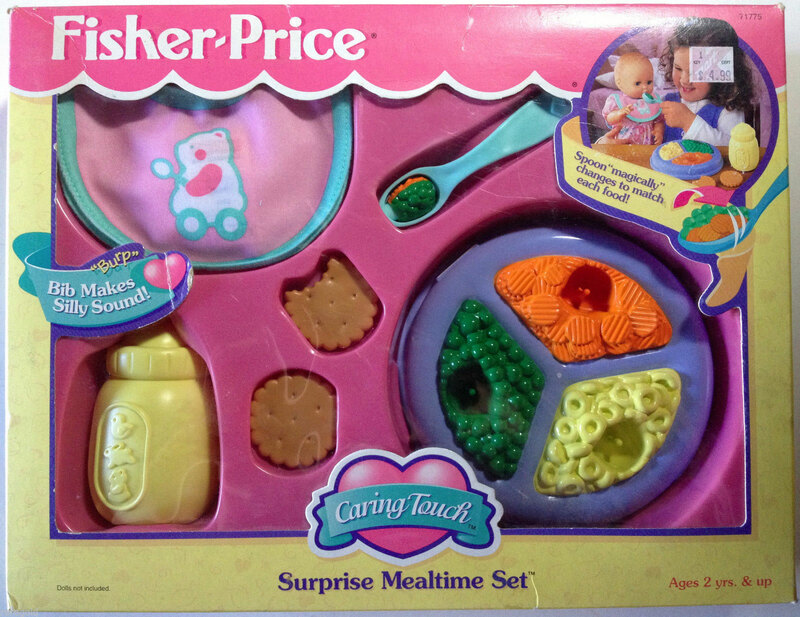 The handle is oval-shaped, marked "Fisher-Price", and has a hole on the end of the handle. The inside of the handle is marked "©1994 FISHER-PRICE, INC., CHINA". Measures 5-15/16" long, 1-1/4" wide, 1-1/4" deep. Description: Large yellow mixing spoon with an oval-shaped handle and a round spoon head (straight vs. curved, like most spoons). The handle has a raised "Fisher-Price" imprint in the middle and an oval-shaped hole on the end of the handle. Back of the handle is marked, "©1987 FISHER-PRICE". Measures 5-3/4" long x 1-1/2" wide spoon bowl.